In the past two months that I’ve used this serum, I’ve had less split ends and noticeably more manageable hair. Although my hair is thinner, it’s also quite long so I do use more than the recommended amount per use. The bottle states to run about a quarter size amount through your hair, but I use almost twice that amount. Once this serum has been combed through, your hair soaks up any excess and your hair is left completely dry within a few minutes. There is absolutely no residue left on your clothes or bedding, and you hair feels fuller once it’s absorbed. With the air-less pump to dispense, there is NEVER a mess to clean up. I simply wash my hands after even distribution. Most hair products I use are usually lightly scented and so by consequence I am extremely picky with what goes in my hair. 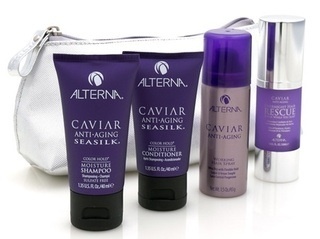 I ADORE the classic Alterna Caviar scent, which is a great plus! Of all the Alterna products I’ve tried, this is a must. It’s definitely a product I can’t give up and it’s always the first thing I recommend to my girlfriends, right next to a couple intense conditioning masks. If you’re feeling adventurous: Alterna made some of their best sellers in their Caviar collection into 1 oz travel minis. This set includes four pieces; the overnight rescue, a fabulous moisturizing shampoo and conditioner, and firm hold hair spray. Being a higher end and prestige line, it costs $30.00, but a little goes a long way!